climate4R is a bundle of R packages for transparent climate data access, post processing (including bias correction and downscaling) and visualization. climate4R builds on two main data structures (grid and station, including metadata) to deal with gridded and point data from observations, reanalysis, seasonal forecasts and climate projections. It considers ensemble members as a basic dimension of the data structures. Compatibility with some external packages has been achieved by wrapping packages, thus enhancing climate4R with new functionalities: extreme climate indices, etc. A number of datasets (observations, reanalysis, seasonal predictions and climate change projections) are used to provide worked-out illustrative examples. Moreover, climate4R is transparently (and remotely) connected to the User Data Gateway (UDG, a service from the Santander Climate Data Service), offering several state-of-the-art datasets for climate analysis. loadeR is an R package for climate data access in a user-transparent way building on NetCDF Java. It allows loading either local or remote data (from OPeNDAP servers) and is fully integrated with the User Data Gateway (UDG). This package has been conceived to work in the framework of both seasonal forecasting and climate change studies. Thus, it considers ensemble members as a basic dimension of the two main data structures (grid and station). Moreover, loadeR is enhanced by the loadeR.ECOMS package which allows to remotely access harmonized data from several state-of-the-art seasonal forecasting datasets stored at the ECOMS-UDG. transformeR is an R package for climate data manipulation and transformation including subsetting, regridding, and data conversion. This package is a dependency for downscaleR and visualizeR and includes illustrative datasets for the climate4R framework. downscaleR is an R package for empirical-statistical downscaling focusing on daily data and covering the most popular approaches (bias correction, Model Output Statistics, Perfect Prognosis) and techniques. This package has been conceived to work in the framework of both seasonal forecasting and climate change studies. Thus, it considers ensemble members as a basic dimension of the data structure. visualizeR is an R package for climate data visualization, with special focus on ensemble forecasting and uncertainty communication. It includes functions for visualizing climatological, forecast and evaluation products, and combinations of them. climate4R is also compatible with a number of R packages for impact studies (e.g. ecological niche models and fire danger), thus allowing the transparent use of climate data in these fields. Figure 1. 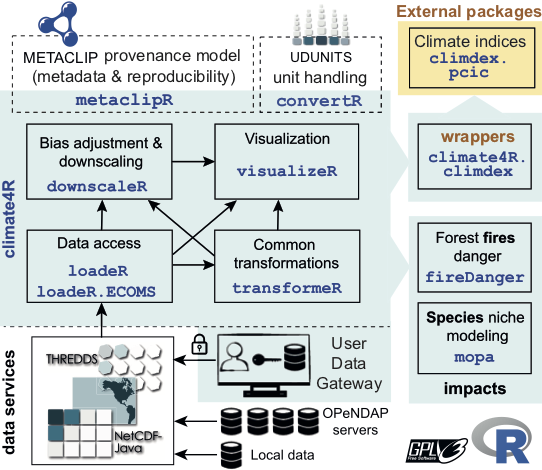 Schematic illustration of climate4R, which builds on NetCDF-Java (and the THREDDS Access Portal, TAP) for climate data access, and includes several packages for data transformation, bias adjustment, downscaling and visualization. climate4R is also compatible with a number of R packages for impact studies, thus allowing to transparently used climate data in these fields. Compatibility with some external packages has been achieved by appropriate wrappers. Arrows indicate data flow and blue shading indicates in–house developments. Bedia, J., Iturbide, M., Manzanas, R., Herrera, S., Gutiérrez, J.M.